According to the BBC thousands of protesters descended on Moldova’s parliament building yesterday to demonstrate against the Communist Party’s victory in last Sunday’s elections. The protesters are thought to be primarily made up of students and young people who claim the results of the election were fradulent despite being approved by election monitors. Unsurprisingly you could follow what was happening on Twitter. The key hashtags are #pman (the acronym of Piata Marii Adunari Nationale, the square where the protests were taking place), #Chisinau, and #Moldova. But a number of commentators claimed that this was the beginnings of the first Twitter revolution and that Twitter had played a "key role in organising the protests". 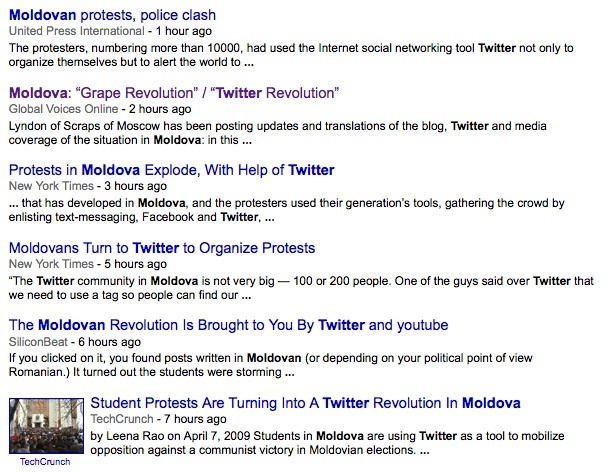 The Telegraph, for example, jumped straight in with this headline: "Students use Twitter to storm presidency in Moldova". Another Telegraph blog post pointed to this foreign policy piece which claimed that after the Orange Revolution in Ukraine, Twitter "will usher in another revolution in neighbouring Moldova". A TechCrunch post on a similar theme is being retweeted numerous times as I write. Read the rest of this post on Daniel Bennett’s blog.